In the 19th century, exceptional flour put Minneapolis on the map. You can see what remains of the renowned mills at Mill Ruins Park. Find peace, get some fresh air, and watch wildlife at the Bruce Vento Nature Sanctuary. 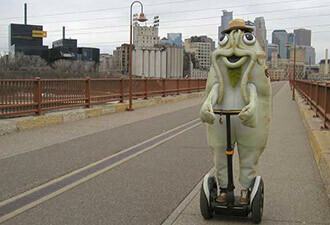 Freddie the Flathead Catfish, park mascot and official spokesfish, welcomes you to Mississippi National River and Recreation Area – his favorite stomping, or rather, swimming grounds! So what makes it great? Nowhere along its course from Lake Itasca to the Gulf of Mexico does the Mississippi River change more dramatically than during its 72-mile journey through the Mississippi National River and Recreation Area. This national park laces together regional parks, state parks and a national wildlife refuge. It is rich with nature, history, culture, and boundless opportunities for fun on and near the river (even fishing, which makes Freddie quite nervous, as you can imagine). Flowing as a prairie stream through the park’s upper 25 miles, the river enters downtown Minneapolis and plunges over St. Anthony Falls, the Mississippi’s only major waterfall. 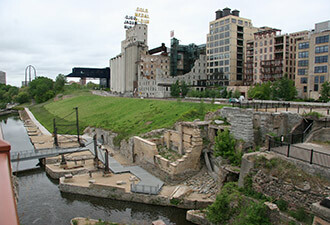 Minneapolis, once the milling capital of the world, produced the finest flour made in quantities previously unimaginable, a story you can hear at Mill City Museum. From the museum, stroll across the Stone Arch Bridge for the best view of the falls. Learn first hand how barge travel north of the falls was made possible at Upper Saint Anthony Falls Lock and Dam. Below the falls, the river enters an 8.5-mile gorge where it makes its steepest drop. Three of the river’s four highest locks and dams step both commercial and recreational boats down 110 feet into and through the gorge. View the workings of the lock system at Lock and Dam 1. Boating in the river gorge you’ll have a feeling of peace and isolation, and forget you’re in the middle of a major metropolitan area. At its confluence with the Minnesota River, the Mississippi becomes a large floodplain river, with a broad valley, many side channels, backwater lakes, wetlands, and wooded islands. This is the river of Mark Twain and steamboats, and the Mississippi most people imagine when they hear the Great River’s name. The confluence is the site of Fort Snelling State Park, Historic Fort Snelling, and the Minnesota National Wildlife Refuge. St. Paul lies five miles below the Minnesota River confluence and began as the Mississippi’s historic head of navigation, the bookend to New Orleans. A few miles downstream of St. Paul, the Mississippi leaves the urban bustle behind and flows past small river towns, scenic bluffs and wooded backwaters. Grey Cloud Dunes and Pine Bend Bluffs Scientific and Natural Areas preserve rare, native ecosystems and offer spectacular views of the Mississippi River. No matter your style, there are many opportunities to enjoy the river! An extensive trail system connects riverside trails to destinations all over the metro region, the state, and beyond. Neighbors and visitors hike, bike, cross-country ski and snow-shoe along the river trails year round. If bird watching or wildlife photography is among your hobbies, the trails and parks along the river provide great viewing. The Mississippi River is a vital migration corridor for roughly 40 percent of the nation’s migratory birds and waterfowl. 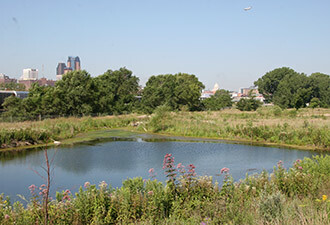 Backwaters serve as critical areas for nesting, spawning, flood refuge and nursery habitat for Freddie’s animal friends both aquatic and terrestrial. Park visitors on trails, in canoes or kayaks, or enjoying one of the paddle boat tours can see eagles, blue heron, and egrets. Turtles, white-tailed dear, and river otter sightings are not uncommon. With so much to see and do, it’s hard to know where to go first! But if you plan to wet a line, here’s good advice from a local, “Don't tell fish stories where the people know you; but particularly, don't tell them where they know the fish.” – Mark Twain.